Want to work in JAPAN or Japanese IT firm based in the Philippines? 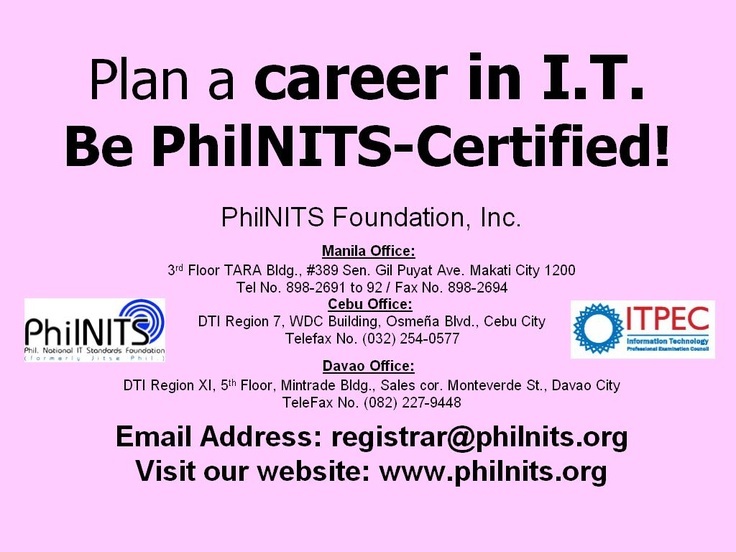 The PhilNITS certification is your ticket to your dreams! The Philippine National IT Standards (PhilNITS) Foundation is a non-stock, non-profit, non government organization that is implementing the following Certification Exams for IT and non-IT Professionals. Level 2: Fundamental Information Technology Engineers (FE) Certification Exams -- Is for Individuals who have basic fundamental knowledge and skills required to be an advanced IT human resource, and who possess practical utilization abilities Defined as human resources with basic knowledge and skills who are able to perform tasks with a certain degree of difficulty or part of the required tasks on their own. An upgrade of AP., still to cover Technology, Strategy and Management ( a whole day Multiple Choice exam with Lunch Break: 2.5 hours in the AM and 2.5 hours in the PM. Level 3: Applied Information Technology Engineers Certification (AP) Exam -- Is for Individuals who have applied knowledge and skills required to be an advanced IT human resource, and who have established their own direction as an advanced IT human resource. - NO age limit , NO degree or diploma required, undergraduates welcome! #1. If you are in Metro Manila, you can visit the PHILNITS office or send someone to register for you, no need for personal appearance. *Bring with you 3 pictures size 2x2 and payment of 1,800. You may wait for your exam permit same day. #2. If you are in CEBU, you can visit the PHILNITS Cebu office or send someone to register for you, no need for personal appearance . *Bring with you 3 pictures size 2x2 and payment of Php1,800. You may wait for your exam permit same day. #3. If coming to the PHILNITS office is not convenient, you may do it 2 ways. 2. Download Application form and send by FAX to (632)4511889, (632)2341573 or send as email or file attach the application form to registrar@philnits.org. *You will receive an email from us once we receive your application form. Cheques may also be sent to Philnits office via mail. Cheque must be made payable to PHILIPPINE NATIONAL IT FOUNDATION INC. (Philnits) and must be CROSSED. Pls Allow 3 days clearing for Metro Manila and 7 days for Provincial cheques. Telegraphic transfer to Philippine NATIONAL IT Foundation Inc.(Philnits) RCBC Savings account. You will be informed of the account number through email. You have to send a photo copy of your transaction slip as proof of payment to PHILNITS Philippine National IT Foundation Inc. either through FAX or Mail. Training for the IP Exams is for 60 hours: for 10 days at 6 hours per day or 20 days at 3 hours per day. Training for FE Exam is for 180 hours: 30 days at 6 hours per day or 60 days at 3 hours per day. Training for AP Exams given to people who have at least 2 years work experience in Software Development is for 180 hours: 30 days at 6 hours per day or 60 days at 3 hours per day. PhilNITS formerly known as the Japanese I.T. Standards Exams of the Philippines (JITSE-Phil) Foundation, Inc is a member of the IT Professionals Examination Council (ITPEC) and also a partner of Commision on Higher Education (CHED) in providing trainings and certifications for Filipino students.